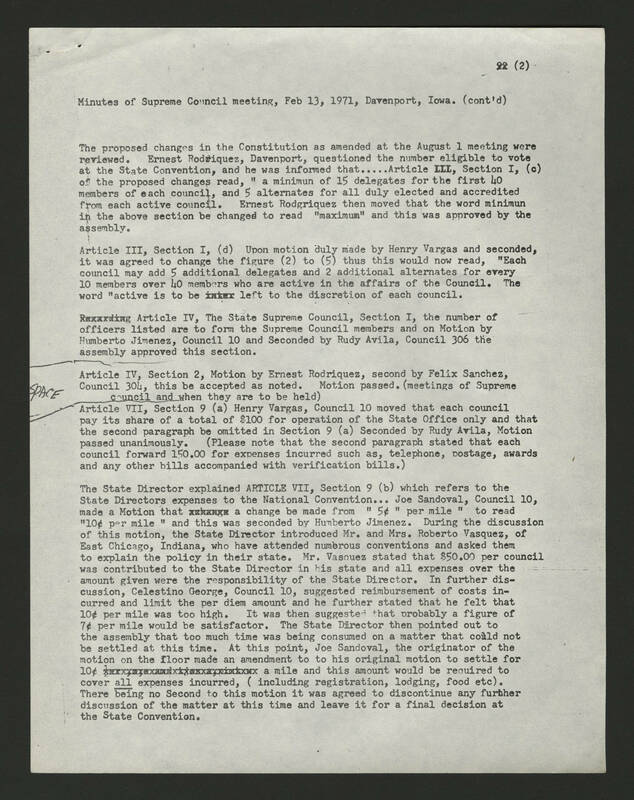 (2) Minutes of Supreme Council meeting, Feb 13, 1971, Davenport, Iowa. (cont'd) The proposed changes in the Constitution as amended at the August 1 meeting were reviewed. Ernest Rodriquez, Davenport, questioned the number eligible to vote at the State Convention, and he was informed that.....Article III, Section I, (c) of the proposed changes read, "a minimum of 15 delegates for the first 40 members of each council, and 5 alternates for all duly elected and accredited from each active council. Ernest Rodriquez then moved that the word minimum in the above section be changed to read "maximum" and this was approved by the assembly. Article III, Section I, (d) Upon motion duly made by Henry Vargas and seconded, it was agreed to change the figure (2) to (5) thus this would now read, "Each council may add 5 additional delegates and 2 additional alternates for every 10 members over 40 members who are active in the affairs of the Council. The word "active is to be left to the discretion of each council. Article IV, The State Supreme Council, Section I, the number of officers listed are to form the Supreme Council members and on Motion by Humberto Jimenez, Council 10 and Seconded by Rudy Avila, council 306 the assembly approved this section. Article IV, Section 2, Motion by Ernest Rodriquez, second by Felix Sanchez, Council 304, this be accepted as noted. Motion passed. (meetings of Supreme council and when they are to be held) Article VII, Section 9 (a) Henry Vargas, Council 10 moved that each council pay its share of a total of $100 for operation of the State Office only and that the second paragraph be omitted in Section 9 (a) Seconded by Rudy Avila, Motion passed unanimously. (Please note that the second paragraph stated that each council forward 150.00 for expenses incurred such as, telephone, postage, awards and any other bills accompanied with verification bills.) The State Director explained ARTICLE VII, Section 9 (b) which refers to the State Directors expenses to the National Convention...Joe Sandoval, Council 10, made a Motion that a change be made from "5 cents" per mile" to read "10 cents per mile" and this was seconded by Humberto Jimenez. During the discussion of this motion, the State Director introduced Mr. and Mrs. Roberto Vasquez, of East Chicago, Indiana, who have attended numerous conventions and asked them to explain the policy in their state. Mr. Vasquez stated that $50.00 per council was contributed to the State Director in his state and all expenses over the amount given were the responsibility of the State Director. In further discussion, Celestino George, Council 10, suggested reimbursement of costs incurred and limit the per diem amount and he further stated that he felt that 10 cents per mile was too high. It was then suggested that probably a figure of 7 cents per mile would be satisfactor. The State Director then pointed out to the assembly that too much time was being consumed on a matter that could not be settled at this time. At this point, Joe Sandoval, the originator of the motion on the floor made an amendment to to his original motion to settle for 10 cents a mile and this amount would be required to cover all expenses incurred, (including registration, lodging, food etc). There being no Second to this motion it was agreed to discontinue any further discussion of the matter at this time and leave it for a final decision at the State Convention.